on Archie Word, follow this link. Unlike the others profiled in this series, John Mulkey did not come west. He did not cross the plains. He was struggling with his final sickness before the first wagon trains left for Oregon. Then why is he profiled here among the pioneers who preached in Oregon and Washington? Because his decision to break with his Baptist heritage was one of the compelling events that influenced those preachers who did travel the Oregon Trail. John Mulkey was born in South Carolina in 1773. His father and grandfather had been Separate Baptist preachers before him and John followed in this honorable path. For background, let's step back several generations. The Great Awakening began in the New England states with the preaching of Jonathan Edwards in 1734 and was continued by the work of George Whitfield about 1740. Among those affected was Shubal Stearns who identified with the Separates, a breakout group from the Congregational Church. Stearns was baptized and ordained in Connecticut in 1751 and three years later moved with five other couples to North Carolina. He organized the Sandy Creek Baptist Church. This was the first congregation of the Separate Baptists. Their preaching was plain, full of warmth and personal concern and they offered the gospel as the source of strength and hope. They were highly evangelistic. At least one preacher from the regular Baptists joined their number -- one John Newton. Shortly after his change-over, he encountered a sucessful farmer and fun-loving young man who liked to fiddle for dances. He taught Philip Mulkey from Isaiah 53 and Philip responded by being immersed December 25, 1756. Immediately Philip began to learn the gospel so he could share it with others. He was a man obsessed. By late 1757 he was ordained to preach the gospel. This was 20 years before the Declaration of Independence was signed. Note that "Newton" appears as a middle name for many later generations of Mulkey men. This shows the appreciation and high regard the family held for this gospel preacher. Philip is the father figure for the largest known branch of the Mulkey family. The life which he adopted for himself has broadly influenced the lives of thousands of descendents, including some today who are 10 generations down the road from our illustrious progenitor. Because the Stearns churches had little contact with main-line Baptist theology, they appear to have baptized in order to complete the salvation process rather than the unBiblical reason of "an outward sign of an inward grace." Philip had a preaching son named Jonathan. He migrated to Tennessee and is referred to as the first Baptist minister in the state. In his younger days, he was more inclined to do active evangelistic work than to be a "pastor" of a church. He finally settled at the Buffalo Ridge church, preaching until he was too feeble to stand. A pulpit-chair was built to he could continue exhorting the devoted people who came. Now back to Jonathan's son John, the subject of this profile. 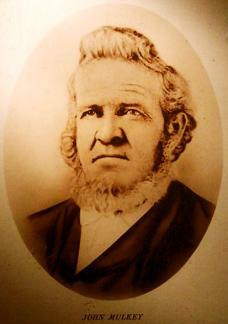 He married Elizabeth Hays and moved to East Tennessee and began preaching by the age of 20. 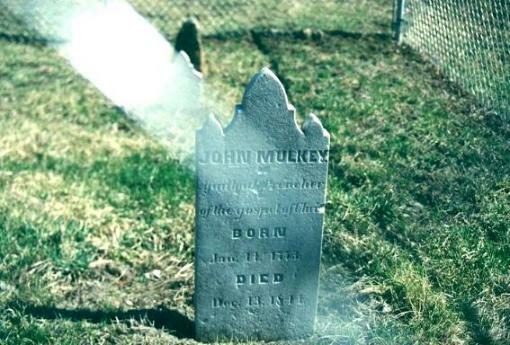 John Mulkey was born in South Carolina, January 14, 1772. His father, Jonathan, moved into East Tennessee and established probably the first Baptist church in Tennessee (Buffalo Ridge) In the 1770's. Jonathan had three sons who all became Baptist preachers : John, Philip, and Isaac. John began preaching in East Tennessee at the age of 20, studied hard and soon won a reputation as a fine preacher. He and his brother Philip moved to Kentucky and preached. He located at Mill Creek but extended his labors beyond the Green River. Restoration Quarterly, Volume 7, Number 3. Mr. Mulkey's earliest contact with "Christians only" was with David Haggard, preaching brother of Rice Haggard. The Haggard brothers were connected to the work of James O'Kelly, all of them former Methodists. John Mulkey, in company with David Haggard, had attended the Cane Ridge Revival. Cane Ridge Revival covered acres. The idea of not testing the faith of others with a denominational creed was intriguing to John Mulkey. 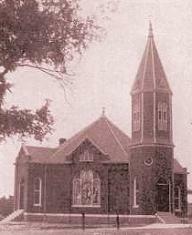 His Mill Creek Baptist Church held to the Philadelphia Confession of Faith. Partly because of his success and influence, John was selected as the Moderator of the Stockton Valley Baptist Association. Some of his circuit riding work found him preaching at the Roaring River Baptist Church in White County, TN. This is where Thomas Crawford McBride was a church leader. There is a profile of Thomas Crawfored McBride. By 1809, when John was 36, he was expressing reservations about the doctrine of unconditional election. That year the Mill Creek Baptist Church voted on John's orthodoxy and a majority voted to side with John Mulkey. He had spoken out against human creeds. The Mill Creek Baptist Church split at that point. The larger group that stayed with John Mulkey became known as the Old Mulkey group, the minority built a new Mill Creek Baptist Church. 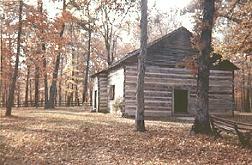 The Old Mulkey Meeting House is now owned by the State of Kentucky and is a tourist attraction. The reader may wish to see the excellent story of John Mulkey's stand for his understanding of God's Word on this link. became the Mulkey Meeting House. John influenced his brother Philip. They both preached that a believer could be a Christian alone and not part of a denomination. They joined forces with Barton W. Stone and others in Christian Union. Stone had recently come to the same realization. The story of John Mulkey's separation from his Baptist heritage is the plot of A Fork in the Road by E. Clayton Gooden. To check the used book trade for the availability of this novel, click this link. Thomas Crawford McBride was another Baptist preacher that left the Stockton Valley Baptist Association and began preaching the "ancient gospel" as they chose to call it. McBride lived directly south of John Mulkey in White County, Tennessee. White County was larger then than it is today. By 1816, T. C. McBride moved on to the freshly opened territory of Missouri. He planted churches and and raised his family. Two of his sons, Dr. James and Dr. Thomas McBride, preached throughout Missouri, then crossed the plains to Oregon in 1846. Their father, now a widower, followed them the next year. There is a profile of Thomas Crawford McBride. Dr. Thomas McBride is mentioned there. There is also a profile of Dr. James McBride. The McBrides and those they influenced were the men in the trenches. They were the men who preached night-after-night in school houses, barns and public buildings. They planted and nourished churches, particularly in Yamhill and Polk Counties of Oregon. While John Mulkey did not come to Oregon, his influence did. And we must include his son Philip. He settled west of Eugene in Lane County, preaching for many years and influencing the direction of the Gospel message in that area. Follow this link for more on Philip Mulkey. John Mulkey of Tompkinsville, KY preached 53 years, delivering nearly 10,000 discourses. He immersed many into Christ. He and Elizabeth are buried on land they owned southeast of Tompkinsville, Kentucky. Follow this link to photographs of their burial place. There were many Mulkeys who aided pioneer Oregon besides those who preached. Charles Ennis Mulkey was Superintendent of Schools in Coos County for many years and was followed in office by his wife Martha at his death. 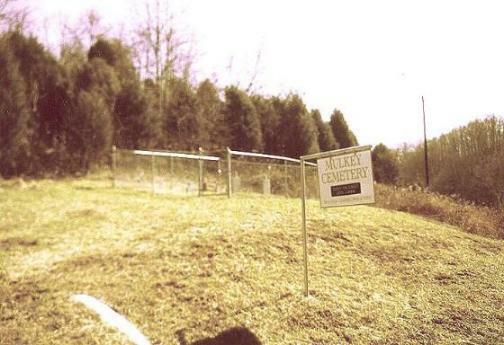 John F. Mulkey preached in Harrisburg, Linn County, Oregon and is buried within sight of Interstate 5. For more about Kellogg, follow this link. Much can be gleaned about John Mulkey from his obituary in the Millennial Harbinger of August, 1845. It was written by Isaac T. Reneau. John Mulkey stood for what he believed. His son John Newton Mulkey spent his years preaching the same message. 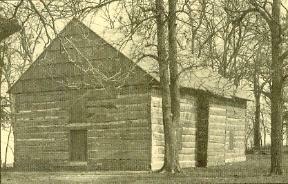 The church building at Glasgow, Kentucky was built under J. N. Mulkey's leadership in 1837. Glasgow is less than 25 miles from the Old Mulkey Meeting House. J. N. Mulkey was involved at Glasgow on and off over the rest of his life. The fire map of 1897 shows the building on Green Street was still standing and in use. 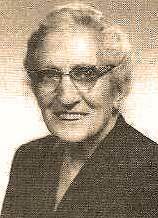 Archie Word's mother Magee (whom this writer knew) lived at the edge of town and attended the Church as a girl. 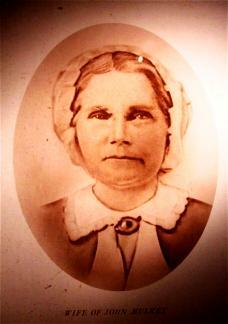 Her life overlapped that of John Newton Mulkey by two years. Archie Word's pre-school church experiences would have been under the influence of the heirs of the Mulkeys. This is the final article that A. Word wrote for publication before his death. In the mid 19th century before the Civil War Tom was placed in a Roman Catholic school in Ireland by his parents to be trained as a priest. He did not like it, and when he was 14 years old he ran away and came to America via a "Wind Jammer". It was a long trip, and he was 15 years old when he arrived in America. Many of the details of this part of his life are missing, but in a few years he went to Tennessee, where he got his first look inside a Bible. Bibles were scarce in those days, and he felt fortunate to have one, so he immediately began to read it. His search of the Scripture led him to read the Bible completely through, and when he had finished, he remarked, "I do not see any Roman Catholic Church in the Bible, I'm going to read it through again" (and he did). When he had finished the second time, he told his wife, "I am going to be baptized." She said, "Why, Tom, you were baptized when you were a baby," to which he answered, "How do I know I was? The Bible says, 'He that believeth and is baptized will be saved.' I'm, going to be baptized." And he was. Soon after he was baptized, he began holding Bible classes in his own front room each Sunday morning. A few years later a group from the non-instrument people put up a tent in his town and began an evangelistic meeting. He went down and listened. After he talked with them, they decided they did not need to start a church there "because", they said, "you have one already in your front room." In time he baptized his wife. That is the story as my mother told it to me. Thus, through her father my mother learned the gospel, and through her I was led to know the truth. Indirectly, Evangelist Archie Word was influenced by the Mulkey movement and formed his views of Christianity based on the zeal of those men and women who followed in the steps of John Mulkey of Tompkinsville, Kentucky. More information is available in Voice of Thunder, Heart of Tears, the biography of Archie Word by Victor Knowles. Follow this link.